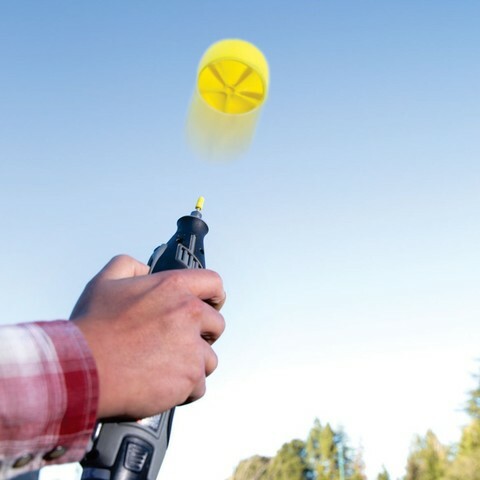 The Dremel Devil is a 3D-printed fan that you launch from your high-speed rotary tool to soar up to 200 feet. This surprising device, like a number of my projects, started out with me working in the lab alone late at night and goofing off with slightly dangerous tools! Read the full story at http://makezine.com/projects/dremel-devil. Grab the file and get printing! -The Dremel Devil was modeled in inches, so if your slicer program defaults to millimeters, youâll need to scale up the part. The Flying Fan Dremel Adapter needs to be super glued or epoxied to a 1" length of 1/8" metal rod. The rod is then inserted into the Dremel tool's chuck or collet. -If you push the Dremel Devil too hard onto the adapter, it wonât release. It takes a bit of trial and error to figure out the right amount of pressure for reliable release. -If your Dremel tool has a brake function when you switch it off, I've found that you can use the sudden deceleration to help the Dremel Devil release and fly farther. -The Dremel Devils I printed out weighed an averaged 20g, we found that heavier ones did not fly as far.